A house is judged visually by it’s curbside appeal, long before a foot is set inside the front door. The outside aesthetic of a home can tell a potential home owner or visitor what they are likely to see once they walk through the front door. If you’re looking to add value and street side appeal to your home, a driveway gate could add the impact punch you’re looking for. But adding a gate to the front of your home is not as simple as erecting a fence and hoping for the best. This could diminish the presentation you’re after. It’s important to choose the right driveway gate design for your home as it has the potential to make or break a home’s front charm. The wrong design could depreciate its appeal, which in turn can diminish the value in the eye of the beholder. First impressions do matter when it comes to home design, so if you’re keen for your property to make an impact on your street and hold it’s resale value (or even increase it), these driveway gate designs that make a statement could be the point of difference you’re looking for. If you’re looking to make a visual impact to the front appearance of your home, you need to choose the right driveway gate design. There are many factors to take into consideration when choosing your design. 1. Local Council Restrictions. Are there restrictions in your suburb on the style of driveway gate you can install? It’s important to discuss with your installer whether the local council has restrictions on your gate choice, the way it can open and it’s proximity of installation from the curb edge. Dean Iron Wilson will be able to give the right recommendations to help with your gate design choice and installation. These restrictions may have implications for the style of gate you choose for your property. 2. Gate Style. It’s important the gate design complements the style of your home. A picket style or baroque patterned gate would match a colonial or heritage style home. A slat driveway gate would suit a modern home with architectural features. Grander homes or townhouses tend to suit the gothic or intricately designed wrought iron gate designs. You may choose to have styles from different eras in your gate design so it matches with your current home style, yet introduce it to features from bygone eras. Mixing vintage and modern styles is not a new trend in home interiors. It can be used for exteriors and your driveway gate design could be the perfect example. 3. How Will Your Driveway Gate Open? Your driveway length and local council restrictions will determine how your driveway gate will open. The landscape of the front drive will also need to be considered. A swinging gate won’t be able to open towards a driveway that slopes upwards. The driveway gate also needs to allow for cars parked on the driveway. An outward opening gate should not be installed on a busy road for safety reasons. 4. Colour of the Gate. The colour of the gate can either complement or contrast with the exterior house colours. If a visual impact is the main objective of the driveway gate design, choose a pop of colour to show some personality. More often than not, the pattern of the gate itself offers enough visual impact without the addition of a powder coating. 5. A run-down driveway gate offers little appeal and certainly doesn’t make a statement. Wrought iron is strong and adds elegance to your property. Its timeless beauty and durability can add character and visual appeal to your home. 6. Manual or Automatic Access. Security and privacy are one of the main considerations when deciding to install a driveway gate. An automatic driveway gate that requires remote control access suggests to pedestrians the house offers the latest in security, which automatically evokes elegance, luxury and ultimate privacy. 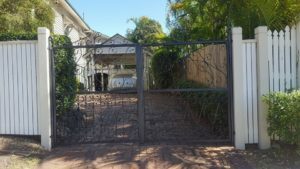 Choosing the right driveway gate design may require some research and a thorough observation of what installations have worked well for properties in the past. Dean Wilson Iron can recommend past design installations to inspire your pattern choice. Is it important for the design to be busy or allow visibility though the iron rungs? Is air flow important to ensure your property is well ventilated and allows for natural air flow around and in your property? This is especially important depending on the climate and orientation of your home. The most important question to consider when deciding on a gate design is, what type of statement do you want your driveway gate design to evoke? The most popular styles of wrought iron fences include Baroque, Gothic and Art Nouveau with the iron being cast and formed to create regal spears, horizontal and vertical columns, sweeping curves and intricate twists and spirals. A vine gate design offers an opulent statement, which can conjure the feeling of arriving at a winery or vineyard. A gothic design can elegantly evoke opulence, offering a grand design for all who enter through its gates. A baroque design offers an artistic statement, which can arouse feelings of warmth and love. An Art Nouveau gate, set in with brick columns, can add a homely yet extravagant feel to the front of your home. This type of driveway gate design suits heritage, federation or cottage style homes. It’s the perfect gate design for a Queenslander style home. For more driveway gate designs that make a statement, why not contact the team at Dean Wilson Iron, who are experienced wrought iron craftsmen. They can offer suggestions on what styles will make your statement driveway gate design a reality. The team are ready and available to discuss your needs and can offer a portfolio of some of Brisbane’s most amazing and iconic fences to inspire the right gate design for your property. Contact Dean Wilson Iron on (07) 3814 0076 or fill out the contact form to organise a free, no-obligation quote.